Please refer to our stock # 2027 when inquiring. Sold as a pair $750 or individual $400, Neolithic Stone Axe Heads, ca. 4000 BCE, found in the Holy Land. Each stone is approximately 1 1/2" high x 3 3/4" long x 3/4" deep. Ex: W. Lebenstein collection, Jerusalem. 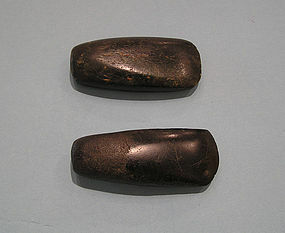 The polished Neolithic stone axe, a heavy implement, was in sharp contrast to the delicate small-rock work of the last stages of the Paleolithic Period and was a reversal of the traditions of products that had yielded ever more lineal feet of cutting edge per pound of stone. The axe and its companion the adz met the need to clear land as agriculture developed as an efficient tree-cutting tool. It may have been used as a weapon during adversarial events. Neolithic people were confronted by the need to clear woodland to create the fields they needed to grow crops and graze livestock. They developed a heavy duty stone axe to perform this task. These were mounted in a wooden haft. Many of these axes were made using locally available stone.